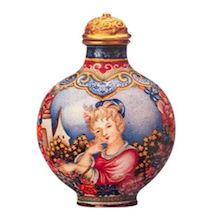 The purpose of small vessels such as the Russian imperial snuff bottle is well known. This example from the Qing Court Collection in Beijing was made for the Qianlong Emperor. Very simply, these vessels were created as a replacement for the unusable European snuffbox. 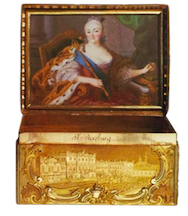 One magnificent Russian royal snuffbox depicts the Empress Elisabeth, daughter of Peter the Great. It was made in 1761, which corresponds to midway through the Qianlong Emperor’s reign. The richness of both the bottle and the box is an object lesson in the social standing of snuff at court at this time in both Europe and China. 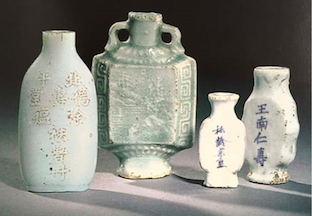 However, it was through the employment of the snuff bottles at the Manchu imperial court in the early eighteenth century and the concomitant artistic endeavor to improve and imbue them with qualities outside of their functional use that these vessels became treasured as works of art. Under the steamy atmospheric conditions in Asia, the European box, with its large hinged top, proved incapable of impeding the humid air from spoiling the dry goods inside. Also, its large size and sharp corners made it cumbersome and awkward. Thus, there was a need for a container that reduced the size of the opening and mitigated the damaging effects of moisture. The soft-edged snuff bottle, which also had a very tiny mouth and was easily stoppered, emerged as the perfect solution. 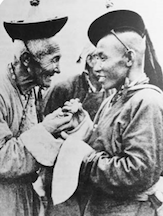 Just as important, the bottle was small enough for easy transport, as seen in a wonderful late nineteenth-century photograph of two horsemen, probably Mongolian, discussing the pros and cons of the bottle that each holds in his hand. 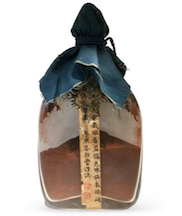 It is very likely that Chinese medicine bottles used for storing drugs would have been the model on which the earliest snuff bottles were based. The picture below illustrates four nineteenth-century examples of medicine bottles, although they would almost certainly have been no different in the seventeenth century. They are inscribed with the names of the pharmacy or the virtues of the medicines stored inside or both. It is easy to see why they served as suitable models for vessels to store snuff. Put stoppers on them and one might be easily fooled. It is also conceivable that the Europeans, who first introduced snuff to the port cities and capitals of the East, on realizing the constraints of their own boxes introduced some other type of vessel upon which the design was further developed. Either way, the creation and development was an unalloyed success. Snuff originated in the Americas and was in common use in Europe by the seventeenth century, where it had become a luxury commodity. The exact timing of its introduction to China from the New World and Europe is unclear, but by the late sixteenth century and certainly by the seventeenth century it was a regular import. Figure 3a shows the established trade routes in the seventeenth century. The following picture shows a glass vessel from the private collection of Bob Hall containing an indigenous Chinese snuff. The vessel, which probably dates to the late eighteenth or early nineteenth century, contains a lovely warm dark brown snuff powder. Early references prove beyond doubt that whereas the smoking of tobacco—widespread outside the royal household—was frowned upon at court, the taking of snuff, a powdered tobacco flavored with various aromatic spices and essences that is snorted into the nasal cavity, was not. In fact, its taking was readily encouraged as a useful medicinal tool. It was believed to cure many ailments, from the common cold to headaches and a host of stomach maladies. During these early years the snuff bottle began to take on more perfidious undertones as a purveyor of favor at court. Once the Kangxi Emperor had embraced the act of snuff taking, it would not be long before the powerful courtiers’ interests obsequiously shifted in the same direction. Thus began a dance of entitlement and graft. Snuff taking became a part of social ritual and helped to distinguish the elite members of society. It remained primarily a northern habit, centered in the sprawling Beijing metropolis. The result of this increasing interest in and intensified production of snuff bottles was not only a windfall for the industries involved, but also a blessing for collectors today. These small treasures reflect, on a miniature scale, the extraordinary artistic achievements of the Qing Dynasty. A recent online publication by Moss and Sargent, The Marakovic Collection, addresses the role of the quality and type of snuff being stored and how it dictated the shape, material, opacity, and in particular, the size of the mouth of a given bottle. Moss and Sargent argue that while these factors could vary for aesthetic and economic reasons, they had to take into account what was best for the storage of snuff and the preservation or enhancement of its flavor. It is likely that elite snuffers had healthy opinions on what kind of mouth, interior, material, and decoration was appropriate for which kind of snuff. Snuff varied enormously depending on its source. Domestic snuff came from the provinces of Shandong, Sichuan, Guangdong, Zhejiang and Jiangsu, while the more-prized and certainly more-expensive imported snuff came from Spain, France, and Scotland, with the most highly regarded of all, Brazil. The bottle on the right of Brazilian snuff is from the collection of Yeung Tat Che in Hong Kong. It probably dates to the mid-nineteenth century. 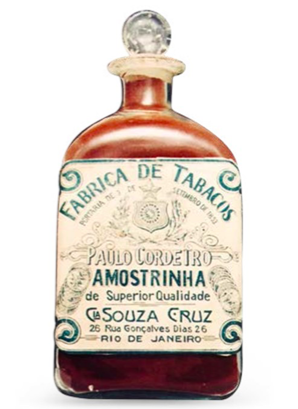 Interestingly, there is a record in 1714 of a gift presented by Father Kilian Stumpf to the Kangxi Emperor of 48 vessels of “tabaco de amostrinha,” the same brand of Brazilian snuff illustrated here. In the West, there seems to have been an equal share of famous supporters and detractors on the subject of snuff taking. In America, one renowned supporter was Dolley Madison, the wife of President James Madison. Her snuff taking was legendary among Washington insiders. A silver snuff box from circa 1800 with her initials inscribed on the lid can still be seen today at the Madison family farm, Montpelier, in Orange, Virginia. A close friend of the Madison family once said that Dolley’s snuff box had a magic influence and seemed as perfect a security from hostility as partaking of bread and salt is among many savage tribes. According to Elsa Glickman in Chinese Snuff Bottle Mania, at the time of the War of 1812, Dolley offered snuff along with ice cream to her guests at a White House dinner. Besides the First Lady, many other fashionable men and women of the early republic partook of snuff. 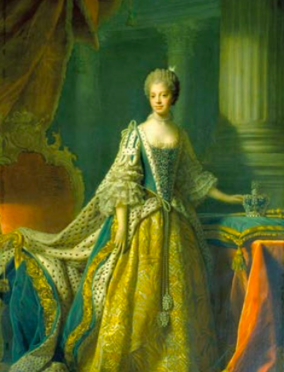 On this illustrious list of royal snuff takers was Queen Charlotte, the wife of King George III of England, portrayed by Allan Ramsay in a lovely 1761 image. Charlotte devoted an entire room at Windsor Castle to her snuff stock and was popularly known as “Snuffy” Charlotte. Her son, George IV, changed his snuff according to the particular time of day and had a storage room set aside in each of his palaces. 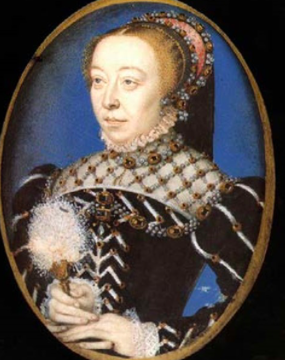 Much earlier in European history, well before snuff got a foothold in China, Catherine de’ Medici, the queen of France and wife of Henry II, had been a snuff convert. Catherine was so impressed with snuff’s palliative effect on her unrelenting headaches that she declared that tobacco would subsequently be referred to as Herba Regina (the Queen’s Herb). A lovely miniature painting of Catherine is attributed to François Clouet from the 1550s. Catherine was introduced to snuff by the French diplomat and scholar Jean Nicot. The Swedish botanist Carl Linnaeus latinized Nicot’s name when he dubbed the tobacco plant, Nicotiana tabacum, hence nicotine. The tobacco plant can be considered his namesake. Catherine’s royal seal of approval would help popularize snuff among the French nobility. 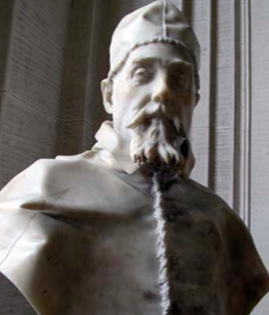 Pope Urban VIII was honored in marble by the incomparable Baroque sculptor Gian Lorenzo Bernini in the late 1630s. This particular pope was an unabashed critic of snuff. He even went so far as to ban the use of snuff in church and threatened to excommunicate snuff takers, including priests. It was said that he felt the act of sneezing was too close to sexual ecstasy. In 1643, the Russian tzar Michael I, prohibited the sale of tobacco and instituted the punishment of slicing off the snuff taker’s nose—a fairly clear deterrent. European explorers and traders, in particular the Spanish and the Portuguese, spread the cultivation of tobacco to the far reaches of their empires. Some sources claim that tobacco, which was imported almost exclusively for smoking, was introduced to the Philippines by the Spanish in the last quarter of the sixteenth century. From there it spread to Japan, Korea, and finally to China. Just as snuff taking in Europe was primarily a habit of the elite, so it was in China. While it did not really begin to take hold until the first half of the seventeenth century, by century’s end, it began to seriously command attention in the royal household. It seems certain that snuff taking was fairly well established as an imperial habit by the later stages of the reign of the Kangxi Emperor. 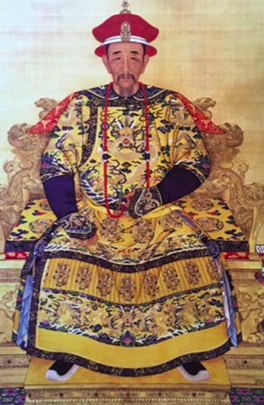 The portrait shows the emperor as an elder statesman in official attire. 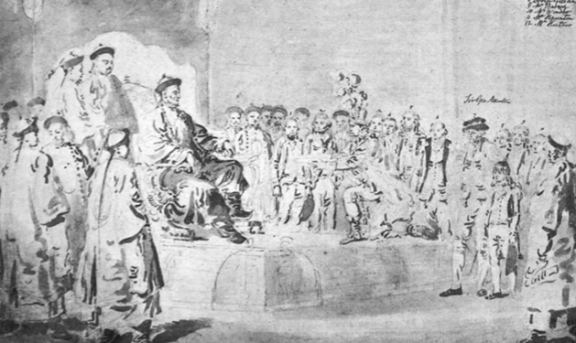 As early as 1684, the Kangxi Emperor—on the first of his six great Tours of Inspection to the South, a major event in the imperial administration of the peripatetic Manchu rulers—was presented with gifts, including snuff, by two Jesuit priests in Nanjing — priests who, incidentally, would have been excommunicated by Urban VIII forty years earlier. The emperor decreed, “We have received your gifts. However these gifts are rare even in your own country. We bestow you [i.e., return], with the exception of the snuff, the acceptance of which meets our approval.” He kept the snuff but gave back all the other tributes. The emperor also conferred presents of both snuff and snuff bottles on worthy recipients. Records for 1703 and 1705 detailing such gifts are widely published. Although no similar references to actual snuff have been found in the records of the Yongzheng Emperor, the Kangxi Emperor’s successor, he did write about tobacco and decried the negative aspects of smoking. The colossal number of artworks commissioned by the Qianlong Emperor during his lifetime is well recorded. Among those that have survived are snuff bottles of wide-ranging scale. A comment by the French Jesuit priest Amiot in 1774 suggests that at that time, snuff taking was still very much centered on the capital. However, a wealth of evidence points to a rapid expansion of the habit across the empire within twenty years. References to snuff and snuff bottles, particularly in the writings of traveling Westerners, are numerous from the 1790s onward. Lord Macartney, the first envoy of Great Britain to China, whose first meeting with the emperor in 1793 is illustrated here by the well-known artist William Alexander, said in his writings about the Chinese, “They also take snuff, mostly Brazil, but in small quantities, not in that beastly profusion which is often practiced in England, even by some of our fine ladies.” This must surely have been a backhanded comment on the English monarch’s wife, “Snuffy” Charlotte. By the mid-nineteenth century, snuff taking had become commonplace throughout China. The scholar and merchant classes replaced the court as the most important consumers. The private sector took over. The result was a greater demand for bottles and the growth of regional workshops to meet it. This mass interest led to mass production, and the Jingdezhen kilns cranked up their firings and churned out thousands and thousands of bottles. The end of the Qing Dynasty also saw the end of the great snuff era.